Can a foreign full-size pickup truck ever be preferred over our top domestic models? Maybe, especially since the Toyota Tundra is designed and built here in America. Let’s find out by comparing the 2018 Ram 1500 with the latest Toyota Tundra. In its current form, the Ram might have been around a while, but there’s a rugged, brutish appeal about that macho front fascia that hard not to like. Each trim level gets its own individual style of grille to separate it from the other models in the family, but they all exude the kind of masculine presence overseas builders have struggled to emulate. If any full-size truck in the current market appears to be trying to take the Ram on in styling, that truck could just be the Toyota Tundra. The Tundra does a dang good job of imitating a domestic model, and the Tundra manages to look almost as macho as the Ram with a look that could have even wider appeal. In the right trim and color, the Tundra might have the edge. It’s up to you whether the lack of a V-6 in a truck lineup is a good thing or a bad thing. But considering how many full-size truck buyers are choosing a V-6 these days, it’s probably safe to say that no V-6 in the Tundra lineup is starting to look like quite the oversight by Toyota. That’s especially the case because the standard V-6 in the Ram is almost as powerful as the standard V-8 in the Tundra. When it comes to V-8s, the Ram 1500’s 5.7-liter V-8 is more powerful than the best the Toyota has to offer. And as the Tundra hasn’t got a diesel to compare with the 3.0-liter turbo V-6 oil-burner in the 1500, this is a definite win for the Ram. A lot of buyers probably won’t push one of these trucks anywhere close to their limits, but it’s always nice to know they can handle more than you might need them to. The Toyota Tundra has a useful towing capacity of up to 10,100 pounds and a maximum payload of 1,600 pounds. 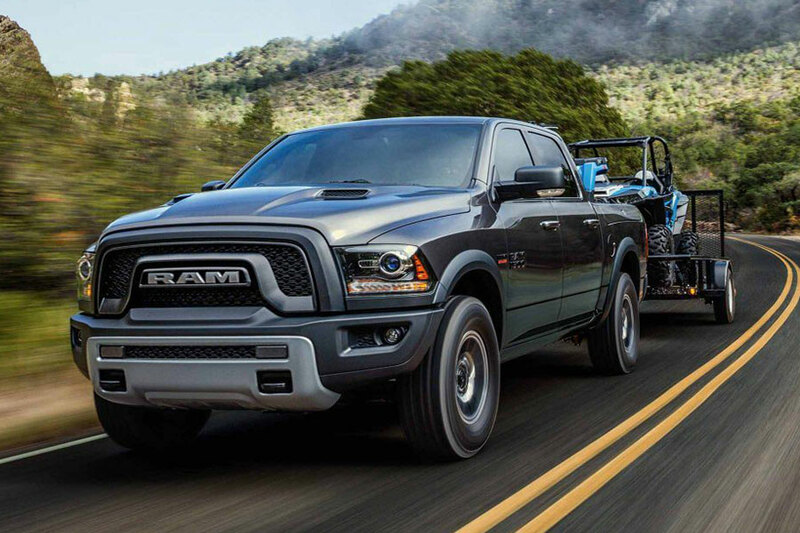 That’s not a long way short of the 10,700-pound maximum tow rating and 1,880-pound payload rating of the Ram 1500, but it’s still another victory for the 1500. Toyota needs to be given considerable credit for doing such a good job of challenging the 2018 Ram 1500 here. And for those looking for a lifestyle vehicle the Tundra could be a serious rival for the Ram, if only the Toyota wasn’t so expensive. Good as the Tundra is, it’s hard to justify having to pay so much more for a truck that’s not quite as good as the Ram 1500.